Egypt Project Temples & Tourist Sites - HISTORY'S HISTORIESYou are history. We are the future. Karnak is the largest ancient religious site in the world, and represents the combined achievement of many generations of Egyptian builders. The Temple of Karnak actually consists of three main Egyptian temples, smaller enclosed temples, and several outer temples located about 1 1/2 miles north of Luxor. It took millennia to build and enhance the massive Karnak Temple. However, most of the work on Karnak was done by the pharaohs of the New Kingdom (1570-1100 BC). One of most famous structures of Karnak is the Hypostyle Hall, a hall area of 50,000 sq ft with 134 massive columns arranged in 16 rows. The Luxor Temple is located on the east bank of the River Nile in the ancient city of Thebes and was founded in 1400 BC during the New Kingdom. The temple was dedicated to the three Egyptian gods Amun, Mut, and Chons. The temple was the center of the festival of Opet, Thebes’ most important festival. During the annual festival the statues of the three Gods were escorted from the temple of Amun in Karnak to the temple of Luxor along the avenue of sphinxes that connect the 2 temples. 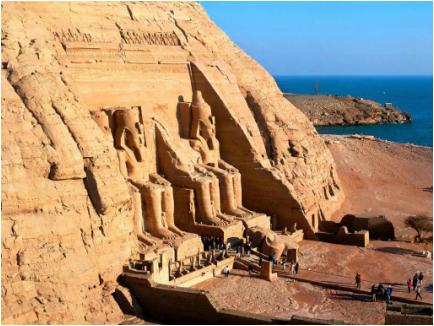 The twin temples of Abu Simbel were carved out of the mountainside during the reign of Pharaoh Ramesses The Great in the 13th century BC, as a lasting monument to himself and his queen Nefertari. The Mortuary temple of Hatshepsut, who ruled Egypt from around 1479 BC until her death in 1458 BC, is situated on the west bank of the Nile. It is a colonnaded structure, which was designed and implemented by Senemut, the royal architect of Hatshepsut, to serve for her posthumous worship and to honor the glory of Amun. The temple is built into a cliff face that rises sharply above it and consists of three layered terraces reaching 97 ft in height. These terraces are connected by long ramps which were once surrounded by gardens. The Dendara Temple is one of the best-preserved temple complexes in Egypt. The whole complex covers some 40,000 square yards and is surrounded by a large, thick mud brick wall. Dendera was a site for chapels or shrines from the beginning of history of ancient Egypt. The most impressive building in the temple complex is the Hathor Temple. The temple has been modified on the same site starting as far back as the Middle Kingdom, and continuing right up until the time of the Roman emperor Trajan. The Hathor Temple is one of the best preserved temples in all Egypt. The island of Philae was the center of the cult of the goddess Isis. The first temple on the island was built by native pharaohs of the 30th dynasty. The temple construction continued over a three century period by the Greek Ptolemaic dynasty and the Roman rulers. The Roman Emperor Trajan built the Trajan’s Kiosk in 100 AD which probably served as a river entrance into the larger temple of Isis.